Alciato at Glasgow: Emblem: In nothos. Sur les bastards. Nam vestri Princeps ordinis ille fuit. Lac, sibi quod fraudis nescia Iuno dabat. Bastards, you should always celebrate the honours of Hercules, for he was the chief of your line. He could not become a god until as a babe he sucked the milk which Juno was giving him, unaware that she was being tricked. Car il est le premier sur tous de vostre ranc. De Juno qui dormoit, & mis dessus son flanc. 1. Hercules was fathered by Jupiter on Alcmene, wife of Amphitryon of Thebes, and became his father’s favourite. 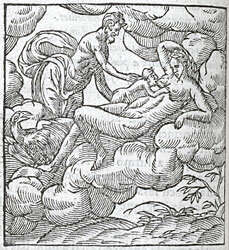 Juno, wife of Jupiter, in jealousy pursued Hercules with implacable hatred. 2. After all his Labours (see previous emblem) and other exploits, Hercules, by the will of Jupiter, was received among the gods. See e.g. Ovid, Metamorphoses, 9.156ff; Cicero, De officiis, 3.25. 3. For the story of Juno tricked by Jupiter into suckling the loathed Hercules see Pausanias, 9.25.2. This divine milk apparently counteracted Hercules’ illegitimate birth which otherwise disqualified him for heaven. See Erasmus, Adagia, 2070 (Ad Cynosarges). 5. Corrected from the Errata.